Self-driving vehicles — 2 years out? 20 years out? ∴ The bus is not acting as a lone wolf, but is actually part of the ginormous Deutsche Bahn (German Railways) network. ∴ This is not a pilot project — that was implemented in the spring. ∴ The bus can drive at a whopping 15 km/h (9.3 mph). Yeah, that’s not the most exciting part of the story. ∴ Bad Birnbach is apparently a “spa town” and the autonomous electric minibus is going between the train station, the town center, and the thermal baths that tourists come in to visit. ∴ The minibus can seat 6 people. ∴ The autonomous electric minibus comes from French company EasyMile. It’s called the EZ10. We’ve written about EasyMile twice before. The first time was in October 2015 (two years ago), when EasyMile provided some autonomous electric buses to the Contra Costa Transportation Authority. The second time was a year later to cover legislation related to that project. But this is not just the second EasyMile rollout. The company has several small and pilot projects in place around the world. 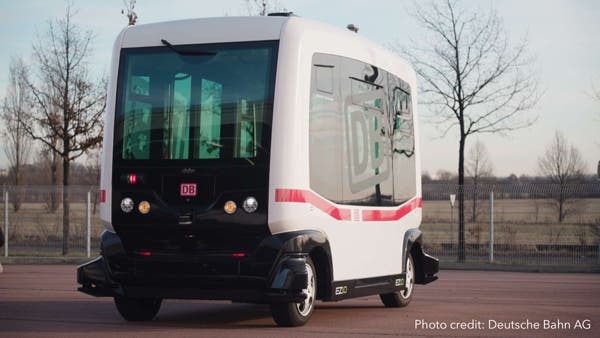 Clearly, the entire Bad Birnbach project is exciting and interesting, and it’s great to see a self-driving electric minibus company moving forward, but there are two things that jump out to me in particular and get my blood pumping. First of all, I think it’s interesting and exciting that this project is in a small town. A couple of months ago, I got word of a small Polish city’s plans to implement an autonomous car zone. It got me thinking: Small cities and towns are ideal places to trial and initially implement self-driving vehicles. Not as plagued with crazy traffic, outsiders plowing through their streets in large numbers, and unpredictable traffic scenarios, they can more easily set aside zones or routes for self-driving vehicles. Self-driving vehicle companies also face fewer challenges in such places. This implementation in Bad Birnbach looks like an example of an ideal use case. I hope it will stimulate similar projects elsewhere. I also love the idea of autonomous electric minibuses. Seating 6–12 people seems quite compelling for moving people in efficient volumes while at the same time keeping transport comfortable and convenient. Large transit vehicles are highly efficient, but they turn off many normal humans. The idea of mixing with so many strangers (and probably being confronted with some odd scenarios) isn’t everyone’s cup of tea. (I love it! But I’m possibly not normal.) But if you move 6–12 people in a vehicle instead of 1–2 people, that’s a much more efficient transportation system and people retain an acceptable degree of comfort and personal space. I expect to see a lot more minibuses roaming streets in 10 years.